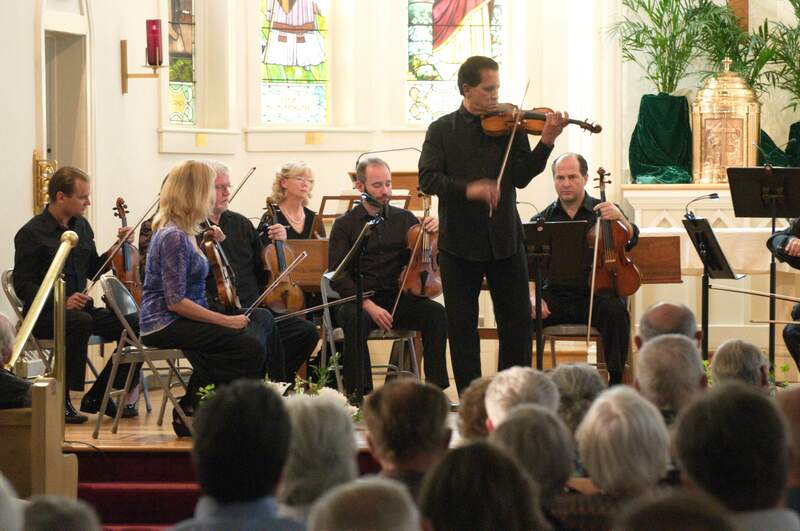 Guillermoa Figueroa, musical director of Music in the Mountains, delighted the audience Tuesday night as he played his Stradivarius for a Vivaldi concerto with the Festival Chamber Orchestra. The concert was held at St. Columba Catholic Church. The Music in the Mountains classical music festival always feels a bit like a runaway train. The first concert delights, and then it’s one event after another, some private, some free, some fundraisers, some around the region, with attendees walking out marveling day after day. And then, just when a bit of festival fatigue is setting in, the final weekend arrives, along with the sadness that three weeks of wonderful music are coming to an end for another year, not to mention that it’s 49 weeks until the next one begins. This is the final weekend, and before I get involved in looking back at a memorable concert, I want to remind music lovers that there are still tickets available for both Saturday’s and Sunday’s concerts. Sunday will bring us the brilliant violinist Philippe Quint on Khachaturian’s Violin Concerto in D minor. Music director and Conductor Guillermo Figueroa always programs a grand finale, and this year the audience will be transported first to Spain with de Falla’s Suite No. 2 from “The Three-Cornered Hat” and then, thanks to Gershwin, to the City of Light with “An American in Paris.” The anticipation is building. I’m one of those people who’s not always too sure about Glass. It’s not a love-him-or-hate-him situation for me, as it is for many music lovers, but rather I like some pieces and others not so much. Figueroa had the lights dimmed for the piece, and the meditative movements were compelling and just right for the setting, the musicians and the audience. The chamber concerts are always intimate, and this was no exception. They’re also an opportunity for us to hear members of the orchestra as soloists, and that’s what I like best of all. At this concert, Figueroa put down his baton and picked up his Stradivarius on Vivaldi’s Concerto in E, Opus 3, No. 12 for violin and strings. Violins made by the Stradivari family in the 17th and 18th century are often named after the most famous person associated with them. You know the maestro comes from a prominent musical family when his Strad is called the Figueroa. One thing we learned about Concertmaster Leslie Shank that night was that when she was a student at The Juilliard School, Figueroa was a legend to her as one of the founders of the Orpheus Chamber Orchestra and concertmaster of the New York City Ballet. Tuesday’s concert also featured solo oboist Lauren Blackerby and trumpeter Russell Campbell on Hertel’s Concerto in E-flat for Oboe, Trumpet, Strings and Continuo. The continuo in this instance was a harpsichord played by Durango’s own Linda Mack. Hertel, Figueroa said, was a composer during the transitional period between baroque and classical, or between Bach and Mozart, as it were. Shank shone on her solo with Oleg Sulyga on another Vivaldi, Concerto for Two Violins in A minor. (The formal name is a lot longer, but who has the space?) It was a musical conversation between two talented violinists. The concert ended on a “Wow!” factor, with Britten’s Simple Symphony, Opus 4, for string orchestra. The second movement, Playful Pizzicato (or plucking) looked extremely complex for the musicians but brought a round of laughter from the audience because it was just plain fun. The concert started with a tailgate party across the street from St. Columba, where prizes were given for the hosts and hostesses who decorated tables à la Santa Fe Opera. About 100 people participated in the endeavor, and based on their rave reviews, next year the tailgate party will be a big draw.